Top O’ the Morning To You! It’s St. Patrick’s Day and people in America are wearing green clothes, drinking green beer, having parades and making green rivers. I say, why not be green inside and out! (See my earlier post, https://mycookinglife.com/2012/03/03/please-dont-eat-the-hyacinths-but-its-okay-to-drink-the-dandelions/). 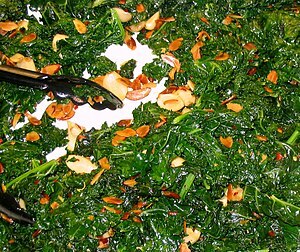 Dark Leafy Greens can be used in soups, stews, or sautees. They can be steamed, boiled or made into crispy snacks. They can taste sweet or bitter or a little spicy, too. Greens are a great source of vitamins and minerals, especially calcium. So if you’re into vegetarian cooking and want a natural, organic source of calcium, eat greens daily! If you aren’t used to cooking and eating greens, let’s start with the basics on preparing them so they aren’t overcooked. 1. First pick out a nice, fresh bunch of greens (organic is best). 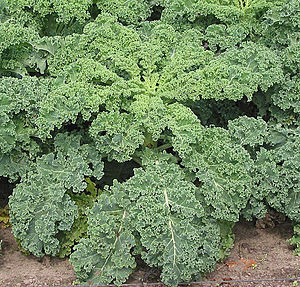 Let’s start with kale, which I consider to be the crown jewel of leafy greens. Check to see that they look vibrant and don’t have a lot of brown spots, rotted pieces and that they aren’t infested with little green-loving insects. 2. Fill the sink or a big bowl or tub with cold water and give the greens a nice bath. This is better than giving them a shower by rinsing them under running water. Make sure you get all dirt and sand off of them and have washed away any insects. Set the washed greens aside to drain. 3. You can prepare and eat the stems as well as the leaves. So just trim the bottom of the stems where they are brown and tough. Then separate the stem from the leaves. 4. If you are going to saute the greens or use them in soup or stew or something, you will cut them up first by cutting the stem in small slices. Take the leaves and stack them on top of each other and slice down the middle and then continue cutting until you have the size of pieces you want. 5. But for the most basic cooking of greens, don’t cut them yet. Bring a pot of spring water to boil with a pinch of sea salt in it. The sea salt helps keep the minerals in the greens instead of having them leech out into the cooking water. 6. Drop the stems into the boiling water. Since the stems are thicker than the leaves, they will take a bit longer to cook. After about two minutes, then add the whole leaves. When the leaves are very bright-looking (a beautiful bright green) take them out and take the stems out and spread them on a platter or something where they can cool off without being piled up. The idea is to let them finish cooking while they cool but not let them get overcooked by piling them up in a bowl where they will retain the heat too long. 7. Once the greens have cooled enough, then you can gently press out the excess water by giving them a little squeeze with your hands, lay out the leaves and cut them as described in step 4 and slice the stems. 8. Your bright green dish is ready to eat or you can add condiments or dressings to it. Condiment ideas are roasted and crushed pumpkin or sunflower seeds, toasted sesame seeds, roasted sliced nuts, dark olive slices, roasted red peppers, or croutons. One thing you shouldn’t do is put anything with vinegar on the greens before you serve them. The vinegar will turn the greens much more dark and you’ll lose that bright color. So if you’re serving them with a dressing, serve the dressing at the table right before they are eaten. 9. One more thing about greens–they can bring a whole new meaning to the popular St. Patrick’s Day expression, “the Wearin’ of the Green.” Be sure to have some toothpicks around! 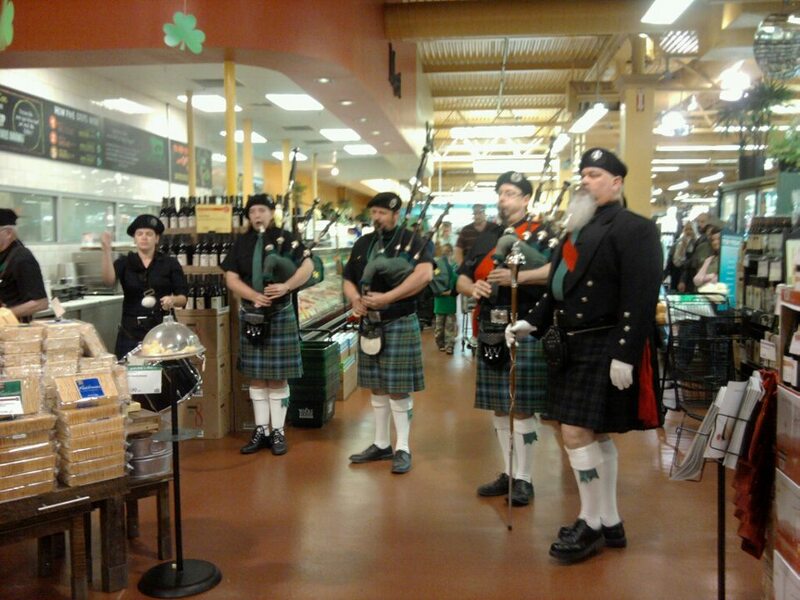 At my natural food store: BAGPIPES ON AISLE 9! For additional free recipes using Green Leafy Vegetables and information about green foods, you are invited to join PATTY’S CLUB! Just go to my new Patty’s Club Page https://mycookinglife.com/pattys-club/ and follow the directions. This entry was posted in Cooking, Food, Health, Life, Recipes, St. Patrick's Day and tagged green food, kale, Leaf vegetable, leafy greens, Saint Patrick's Day by mycookinglifebypatty. Bookmark the permalink. Thanks for pausing! Kale is my favorite leafy green!